The markets in 2018 were our lifeline. They were both the most challenging and very fun simultaneously. Every market had its own charm and set of amazing marketgoers. The markets of 2018, were quite the learning curve. From arriving late to set up, equipment not working and losing sleep, these markets were the most rewarding part of my business experience. The extensive detailed planning for the markets took place in 2017 and early 2018. This included going to outdoor food fairs, which allowed for delicious field research. Following the field research, more online research was conducted. There is an incredibly large database out there on launching a food business. From podcasts, blogs to videos to social media accounts, there are endless resources online to guide you in the right direction for your particular business. The research was rather time-consuming yet somewhat entertainment. On my home from work, I would get excited to listen to my podcasts on food businesses and then to get home and write down all my ideas for the day. Finally, our first event was meant to take place during the second week of February. We had already posted our launch and got our 5 followers very excited. Unfortunately, our spot was double booked. Thankfully we were promised a spot for the following month. I considered this the first failure and doubted the early launch of the business. Maybe I was not prepared enough, maybe I missed something, maybe the launch should we postponed even further. Before the doubt could grow, the founder of “Made By Hand Markets" Mrs. Monifa Kincaid reached out to me, to invite us to join her market. It was like heaven sent, this was the sign needed to go ahead with the launch. The planning and preparation for this market included gathering equipment, buying ingredients and finalizing paperwork for markets and for the commercial kitchen. The day of the market approached quickly. On the eve of the Market, a Friday it had literally snowed and I had to do the grocery run and deliver it to the commercial kitchen with my cute red shopping cart on the G train. It was strenuous but I was so very excited. I then went back home. 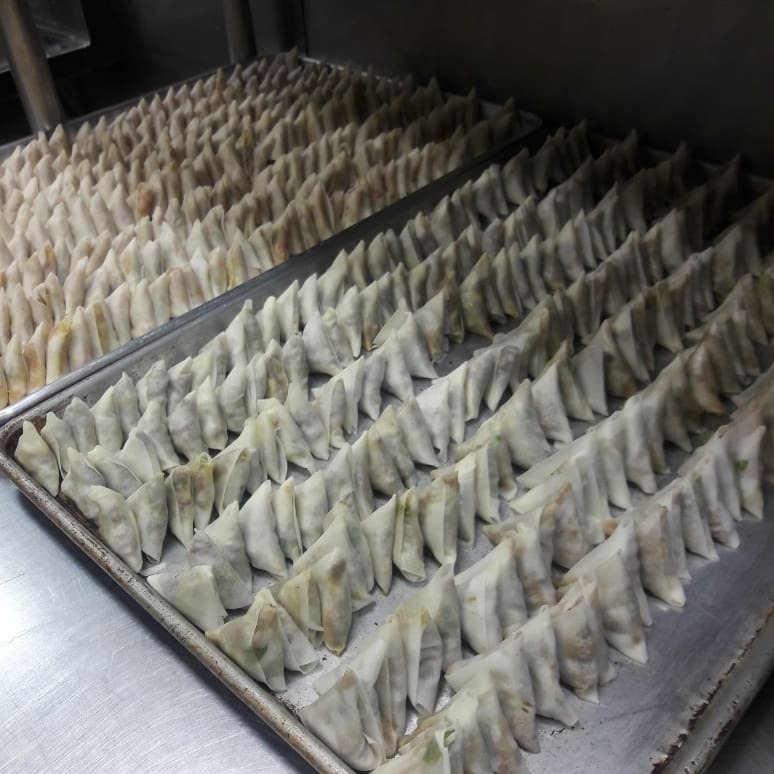 At around midnight I returned to the commercial kitchen, as I had no sense of time management and was unfamiliar with the kitchen it took me a long time to make about 800 samosas, dipping sauces and hot sauces. All this was made from scratch by just me. It was challenging. I had not slept and the time of the market was approaching swiftly. I left the commercial kitchen in time but packed the Samosas and sealed them off, which was a nono as they would turn soggy. There was loads of traffic near the venue and I arrived with a few minutes to spare before the market. Set up took a while and the customers were walking in as I was setting up. I was very embarrassed. But I finally set up and the samosas thanks to the heat got crispy again. The first few people came up and tried the Samosas and they were in awe about the flavors and dipping sauces. Some people came for seconds and even thirds. At that moment I was over joyous. Despite not sleeping, and being extremely frustrated and embarrassed, the people at the market were so very kind to me and encouraged me as they loved the Samosas. Other vendors gave me great advice and Mrs. Monifa was so very kind and calm and encouraging that all my fears had just faded. It was a success and I was so very proud of myself. I knew then I would love to do this every weekend even if it meant I would not sleep again. The Queens Night Market was a beast of its own. If the first few Markets and events were challenging, then this was the marathon. I was very honored to have been accepted to participate in this iconic Market to Queens and New York as a whole. A year before that I had attended the Market as a foodie and loved the experience, I had become a fan. I had signed up for Months of consecutive Saturday Markets and did not know what I had signed up for. I remember vendors were surprised that it was a one-woman show. There too I came somewhat late to the setup and had to go to home depot to get a fire extinguisher as they would not allow me to participate without one. I finally set up and my burners would not work. I had to turn multiple clients for the first 20 minutes and had basically given up. Then I remembered a podcast that said that the community of vendors is strong and tight-knit. I humbled myself and asked other vendors if the had an extra burner for the market and thankfully they did. @mumskitchensnyc was my savior that day and she was so very gentle and kind about helping me out, I secretly cried. That was the most beautiful gesture and I am forever grateful. Down the road, @mumskitchensnyc gave me lots of advice and would always check on me. The Market was fun, yet in 2018 for some reason, it seemed to rain on many of the Saturdays unfortunately. Though the Market so very high attendance numbers on some days, the rain really did impact the possibility of faster business growth. Nonetheless, this market thought me so much. For this year, 2019, I have a clear vision for the Markets. I had applied to this market literally a few days before it took place. Though I had missed the deadline it was imperative that I was present at this market as I lived on Church Avenue a the time and the market took place just down the street from my home. Being a part of the community there was no way I would not take part in this market, especially after telling all the local business that I had launched my own business and after asking them for advice. I arrived in time for the Market and was shocked that tents were not provided. Thankfully the Samosas were frozen and well packaged. A popular store on Church Avenue Bobby's saved me. The day I needed a tent they were selling the tents and the size of the tent I needed was only sold in the color red. Red happens to be my favorite color! If this was not a direct sign that I was on the right path following my passion, then I don't know what is. The World's Fare is a one-day event that has over 40 different vendors representing cuisines of every nation on the globe. It is literally a fare with live music and contests with a beer tasting section and tens of thousands of visitors. We were very excited to have been a part of this market. This fare gave us a brief appearance on NY1 which was incredible for having just had a few weeks of market experience. That was another sign to keep on and grow this business. It was a blessing to be able to represent Sudan at such an event. In Addition to Sambuxas other Sudanese dishes were served. This market is one of the more relaxed markets as it is indoors and tables are provided. There is an amazing community of craftsmen and women at this market that made me want to spend any penny earned that day if I could. The market takes place at the beautiful Greenpoint Loft, which allows for a very laid back commeradery. The local community comes out and supports the market regularly and are very curious about the story of the vendors. they usually look for originality, sustainability, and health. I truly enjoy selling at this market. We will be present at the upcoming Valentine's Day Market. Check our Instagram and Facebook to stay updated. The Taste of Africa Festival is perhaps one of the most fun markets out there. With African chefs, live music and entertainment, this market is more like a large African Gala than just a food festival. I truly enjoy this event in particular due to the fun atmosphere and the amazing not so common foods. This market was also indoors and easy in terms of setting up and break down. I was easily able to do this on my own. Check our Instagram or Facebook account to see the upcoming event in February. In addition to markets, SAMOSA NYC also took part in various events around the city. I also catered private events and personally delivered food orders to customers around the city. 2018 was an excellent year, we are soon to be 1 year old and are very excited about what 2019 has to offer. Stay up to date on our upcoming events, come taste our samosas and stay tuned for next weeks blog post on Sudan's culture of food and hospitality.